Enthusiasm is typically high when student blogs are first set up. Students often can’t wait to unleash their creativity and publish for an authentic audience on their own online space. Sometimes when the initial excitement wears off, students start facing ‘bloggers’ block’ or get in a rut of writing the same style of post over and over (eg. ‘My favourite…’). With a little guidance and encouragement, you can ensure your students reach their full potential as a writer, while extending themselves by exploring various genres and mediums. This post aims to provide prompts to inspire you and your students for a whole year of blogging. This is a lengthy resource, but scroll down and you will find a PDF version that you can save, print or share! This post was originally published as 50 Ideas For Student Blogging And Writing Online by Ronnie Burt, on The Edublogger, in October 2015. 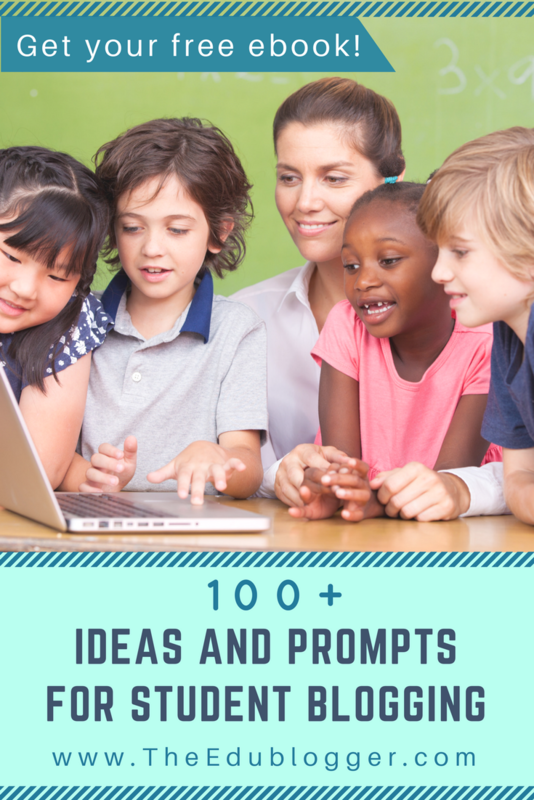 In October 2017, it was updated to 100 Ideas by Sue Waters and Kathleen Morris, with some added links to posts by student bloggers for even more inspiration. 1. Reflection – Deep thoughts and self-reflection on what you’ve learnt or what you’re thinking about. Putting it all out there can really help organize thoughts and ideas. Yu-Liang Shih’s reflection post and Andrea’s reflections on camp demonstrate how this style can be used as part of a student blog. 2. How-to/Helpful – The classic ‘how-to’ essay can be enhanced with pictures, videos, and other media. Yuka’s Ambassador of 2:1 Program (iPad advice) is a ‘how-to’ for other students and their parents. Alkkarose created a tutorial on how to create DIY bookmarks. 3. Journal/Diary/Recount – This is a versatile style of post that’s great for reading logs, field trips, science labs, special events, study abroad, etc. Emma’s Niigata Expedition is a journal post documenting reflections from a hiking trip. Molly recapped the Potato Olympics held at her school. 4. News/Announcement – These posts aim to keep readers up-to-date with important information. RIP Dabbing by Arielle and Goodbye Grade 7 by Kaiya are announcement posts. 5. Marketing/Sales – Typically these are commercial style posts. Students could use blogs to advertise school events and fundraisers etc. The students at Auroa School made a video to promote their school. 6. Controversial/Debate/Editorial – This involves taking a stance on an issue, while backing up thoughts with facts and proof. Examples include: Sidd’s debate on cell phones in schools, and Jackson’s Kids Watch Too Much TV. 7. Reviews – Think Amazon or TripAdvisor reviews. Students can review lessons, field trips, videos, books, games and more. Thanumi reviewed three websites for creating animated videos, while The Electronic Pencil sixth grade students reviewed video games. 8. Resource/Reference – These are similar to the how-to posts, but something people might bookmark and come back to again and again. Refer to Yuka’s Fair Game post, Elise’s list of keyboard shortcuts and Brooklyn’s collection of life hacks. 9. Ongoing Series – Choose any of the above, but split it up into several shorter posts that get published over a set period of time. Shahreen’s HIV/AIDS (Part 1, Part 2, Part 3) posts are a good example of an ongoing series. 10. Curation Posts – Sometimes people use a blog post or page to curate a list of resources on a particular topic. Refer to Curation: Creatively Filtering Content by Sue Waters for more information. The format of blog posts is evolving. Now there are a number of ideas on how to structure posts. They can be long or short, heavy with text or heavy with visuals and multimedia. The choice is yours. Informal – This style include short paragraphs and doesn’t always follow academic writing standards. Lewyliel’s Wordle is an informal post. Long Form – This is a comprehensive post like a chapter of a book. The Edublogger’s Twitteraholic’s Ultimate Guide to Tweets, Hashtags and all Things Twitter is a long form post. Long form posts aren’t common on student blogs but are often popular on traditional blogs when used to share advice or resources. Micro-blog – These are short posts of a sentence or two that usually link to another site or encourage readers to leave comments. Comments Count is a micro-blog example. Listicle – A listicle is a post that uses a list as its thematic structure – the post you are reading now is a listicle. Titles often start with something like ’10 ways to…’ Josie’s Top Ten Strangest Animals and Ethan’s Top 5 Video Games are listicles. Slideshows – These are sometimes created as an alternative form of a listicle. Thanumi used this approach to share her favorite authors and their books. Photo Posts – Images can be used as prompts, to demonstrate or to share a journey. Helen’s Original Shirt Design uses a series of images to document her process of designing a shirt as part of her portfolio. Podcasts – Audio (or video) shows are becoming increasing popular. Paige produced a podcast on the Stolen Generation, while The Electronic Pencil students created podcasts on why they write. Video ‘Vlogs’ – A video can be embedded with extra information, links, or a summary. Here is Thanumi’s comment starter video. Writing is a learning process. The more you write, the more you’ll learn and the better you’ll get. As you think about writing assignments for your students, try to vary it up. Even better, give your students some choice in the type of posts they write. The end goal is a relevant, authentic and engaging learning opportunity for all. It can be helpful to keep the SAMR model in mind. Sometimes, you might simply be substituting traditional pen and paper tasks for an online task. As you and your students become more comfortable with blogging, consider ways you can redefine tasks to achieve something that would not be possible without a blog and online tools. Ready for 100 prompts and ideas? Let’s dive right in! Research has shown when students are asked to write for a real audience, their writing has better organization and content, is longer and they learn more than if they were writing for just their teacher. 1. The Student Blogging Challenge – This runs twice yearly, in March and October. It is made up of a series of 10 weekly tasks designed to improve blogging skills while connecting students with a global audience. The challenge is supported by a team of blogging mentors. 2. QuadBlogging – This simple project involves connecting your class with a quad group of four classes. Over a four week period, each classroom takes turns being the focal point of the quad. Kathleen’s students made a video about QuadBlogging to explain the concept. 3. Global Read Aloud – This is a popular project created by Pernille Ripp that runs each year from early October to mid-November. Participants read the same book aloud to their students and then use whatever online tool they prefer to connect. 4. Twitter – Some teachers use class Twitter accounts to share posts and to connect with other classes and content experts. Drew Frank’s Classroom Twitter list is a good place to find class Twitter accounts to follow. He updates the list annually. 5. Comments4kids – #Comments4kids is a Twitter hashtag used as a way for students and teachers to find blogs to comment on, and to get their own posts commented on. You could ask for comments on an outstanding student post, or as encouragement for particular students. 6. 100 Word Challenge – This is a weekly creative writing challenge for students under 16 years of age. Each week a prompt is given, which can be a picture or a series of individual words, and the children can use up to 100 words to write a creative response. 7. 5 Sentence Challenge – Similar to the 100 Word Challenge but for younger students or those learning English, this challenge involves responding to a prompt using five sentences. 8. Projects By Jen – Developed by Jennifer Wagner, this project hub provides a wide range of activities that teachers can use to connect their class with classes around the world. 9. Skype in the Classroom – This Microsoft Community offers teachers and students the chance to connect through Virtual Field Trips, Skype Collaborations, Guest Speakers and Mystery Skype. Mystery Skype involves connecting classrooms by playing a yes/no guessing game. Learn more about Skype Etiquette and Mystery Skype on Mrs Morgan’s Superstars’ blog. 10. International Day Dot – This is held annually on or around September 15 as a means of celebrating creativity, courage and collaboration. We have compiled a guide with examples on how to participate in International Dot Day. 11. Visitor Tracking widget – This displays visitor numbers and their geographical locations which helps students appreciate they are publishing for a global audience. We have compiled a list of the most popular visitor tracking widgets used on student blogs and how to add them. Fluffy Whiskers wrote a post explaining how to install a Flag Counter. 12. Family Blogging Month – Linda Yollis came up with the idea of running a challenge to encourage more family members to leave comments. Refer to her blog and wiki for more information. 13. Question for Parents – Encourage families to comment with a question specifically for parents. Miss Jordan’s class have an example post on their blog where parents were asked about old technologies. Students could also pose questions on their blog for a specific audience. 14. Celebrate Comments – Use a blog post to highlight recent comments and encourage connections. Linda Yollis has an example on her class blog. Students could create a post like this, or a class blog could be used to showcase posts and comments from student bloggers. Check out our Teacher Challenge guide for more detailed information on connecting with others. These topics are ideal for getting students used to publishing online. Tip: ensure students are aware of what information should be kept private before they begin blogging. You can also use My Class to moderate students’ posts and comments. 15. Autobiography – Who are you? Share your hobbies, interests, family background, and anything else you want others to know about the real you. Your post could be descriptive like Penelope’s About Me or creative like Kimberley’s A-Z description. 16. Avatar – Create an avatar to use on your blog and write a post to explain how it represents you. Check out Brianna’s My New Avatar (and my tenth post), and refer this explanation on how to create an avatar. 17. Commenting Guidelines – Write a post to explain what you expect when someone leaves a comment on your blog. It can be descriptive like Darcy’s commenting post or creative like Warrior Kat’s Scourge of Blogsphere on the Loose. 18. Goals – Share some goals that you have set for yourself. An example format could be: one goal for this week, one goal for this month, and one goal for this school year. Describe how you plan to accomplish your goals. Alexis has written a reflection on her term goals, while Kayleigh created a bucket list on her blog. 19. Holiday – Share what you did on a recent holiday or vacation. Include photos or videos if you have permission. Check out Maggie’s 10 Days of Pleasing Paris or Hudson’s reflection on his trip to San Francisco. 20. Hero/Mentor – Write about someone that inspires you. What is it about this person that makes them so special? Terapat (Tony) shares why soccer player, Chanathip, is his favorite person. 21. Digital Citizenship – Come up with a set of rules or guidelines for publishing online. How is writing online different to writing in private? Refer to The Student Blogging Challenge’s Footprints for resources and ideas. 22. My Country or Culture – Publish facts about your country or write a post on food, songs, stories, clothing or a cultural event that is popular where you come from. Check out Thanumi’s Fun Facts About Greece or My Country for inspiration. Additionally, Thunny’s Culture and Family post explains how the Songkran festival is celebrated in her country. 23. My School – Write about your school, the history of your school, a famous person who went to your school, your favorite subject etc. Mrs Yollis’ students made a video about their school to share with their blogging buddies. Also, check out Gracie’s Dress to Impress post on school dress code and Olivia’s school history post. 24. Favorite…anything – Publish a post that discusses topics you’re passionate about. You could write about your favorite animal, foods, activities, TV show, movie, holiday etc. Lucie’s choice was Friends, TV and popcorn. Karah shares her favorite sports, and Marianne shared her story creating passion. Victor shares why Christmas is his favorite holiday, while Leila explains why she loves 4th July. 25. Pobble 365 – Every day there is a new photo prompt and literacy starters posted on the Pobble 365 website. Students could respond to these prompts in a blog post. 26. New York Times Writing Prompts – Multiple times a week, The New York Times publishes writing prompts for students. There are Picture Prompts (images with questions), What’s Going on in this Picture? (images stripped of captions) and Student Opinions (daily questions inspired by Times’ content). 27. What’s Going on in this Graph? – Another initiative from The New York Times, a graph, map or chart is published regularly as an invitation for students to discuss. 28. Language is a Virus – This site has a multitude of prompts, exercises and gadgets to inspire students’ writing. One example is Visual Poetry where students can display their writing in artistic and whimsical ways. They could then screenshot their creation for a blog post. See the Visual Poetry examples for International Dot Day from Kevin’s Hodgson’s students. 29. Practice Your English – MMG’s English blog has been created by a teacher with prompts for students to practice their English. You will find jokes, quotes, recipes, videos and more. These prompts could be useful for any students. 30. Visual Writing Prompts – Teach Starter has created a collection of visual writing prompts. The images are Creative Commons Zero which means students are free to upload them to their blogs. 31. Creative Writing Prompts – Writer’s Digest offers regular written prompts which would be ideal for older students. 32. Writing Prompts for all Grade Levels – Edutopia has published an interesting list of topics that students could refer to. 33. Scholastic Story Starters – This is a fun interactive site for students in K-6 to create their own prompts for a variety of writing genres. 34. Wonderopolis – This is a popular multi-disciplinary site. A ‘wonder of the day’ is posted daily with lots of kid-friendly information, definitions and a quiz. Students could choose the daily wonder or a past wonder and reflect or summarize it in a blog post. You can even add a Wonderopolis widget to your blog. 35. Interviews – Publish a transcript of an interview with someone. Provide an introduction and summary of the main points of the interview. Karah interviewed various family members and created avatars for them, while Anisha interviewed her mum. 36. Wikipedia Entry – Without going to the actual Wikipedia site, publish a post that reads like a Wikipedia article on a topic you are studying. Include references, images, and more. Tsuyoshi’s History of Comedy is an example of this approach. 37. FAQ – Write ‘Frequently Asked Questions’ and answers on a topic. Here’s an example of FAQs about blogging by Leigh Cassell. 38. Checklist – Put together a list of steps that need to be followed to complete a project, accomplish a goal, or solve a problem. Check out Hayley’s checklist on the ICT curriculum. Silvia Tolisano has published a blogging checklist that could be useful to teachers and students. 39. Test Review ‘Cheat Sheet’ – Use images, videos,and writing to create a post that your classmates can use as a study guide to prepare for an upcoming assessment. Here’s an example of a Cheat Sheet for Git/Github. 40. Quiz – Create questions that you think may be on the next class test, or create a quiz on a topic that interests you. (Teachers – if students completed the first option you could even use some questions from their quizzes when creating the next assessment). Check out Summer’s quiz about herself. You could even try to embed a Quizlet in your blog like Learning English in MetroWest. 41. Exit Ticket – Write a summary of what was learned in class before leaving. Include any questions you still have and a list of any assignments or tasks you still need to complete. Check out Shoichi’s Session with Kindergarteners post. 42. Quote – Choose a quote that inspires you or is relevant to what you are learning. Explain why you chose the quote and what it means to you. Ashley posted a quote reflection from G.R.A: Fish in a Tree, while Louisa created a weekly quote series on her blog. 43. Video Comparison – Embed two or more videos on a topic from YouTube, Vimeo or TED and then compare and contrast the videos. Refer to our guide on how to add videos from video sharing websites to posts. 44. General Comparison – Choose two things to compare against each other. It could be two books, two people or two school subjects. Or it could be broader comparisons like city/country, nature/nurture, cats/dogs etc. Alexia compares YouTube and NetFlix, while Katie weighed up singing and writing, and asked readers to make their choice in a comment. In a simpler format, the young students in Team 2 Eagles posted Would You Rather? questions. 45. Artwork – Share photos and descriptions of your artwork in a blog post. Lea shares her water color, while the young students from Open the Door to B4 showcased their artwork progression. 46. Photo Blog – A few years ago there was a rise in 365 photography or ‘a photo a day’ type blogs. This is something Linda Yollis still does with her Yollis’ 365 Project. Students and the community are invited to send in photos and captions. Student bloggers could create a similar style blog or post series. 47. Future Me – Write an email to yourself when you are one, five or ten years older. This could be a blog post in itself, or for 13+ students, the FutureMe website could be used to actually send the email. 48. Jokes – Who doesn’t like jokes? The TLC Tutoring Updates blog used images and scrolling space to format their joke post. In a different style, The Year 2 Champs in Western Australia published their jokes in the comment section. 49. Gratitude Journal – This reflective tool is popular in many classrooms. Students can use their blog to reflect on what they’re grateful for. Even young students can get involved like the children from Swoop into Kindergarten. 50. Guest Post – Offer another blogger (or someone without a blog) a chance to publish a post on your blog. Student blogger, Miriam, had her brother, Michael, guest post about hiking on her blog. 51. Meme – These are fun messages that are spread widely online. My Virtual Classroom shares their meme creation activity on their blog. 52. Days of the Year – Use a website like www.daysoftheyear.com to find out what fun or lighthearted days are being celebrated. For a more serious approach, select an International Day from the United Nations International Day list. Write a post to explain the special day and what it means to you. (Note: you may want to choose the days for younger students, rather than allowing them to browse these sites). 53. Music – This can be embedded into blogging in many ways. Emily has included a playlist widget on her blog, while Miriam shared a video of her piano recital. Students could write about their favorite songs, like Kayley, or embed videos of their favorite artists. The Curiosity Films students were involved in a math music project that’s worth checking out. 54. Puzzles – There are various ways to make puzzles for readers. 4 Pics 1 Word was a popular game on devices a few years back. Kathleen’s former students made their own 4 Pics 1 Word games for others to guess. The students in 3/4L have a puzzle page on their blog, while Sienna made a puzzle with Creative Commons images. 55. Curated List of Resources – Create a list of sites and resources about a topic to share with others. Kathleen has created posts and pages to collate resources for her students in the past. These are links to online games or activities that students could access at home to practice their skills. Jahyun wrote a post to collate a bibliography. 56. Principal for the Day – What would you do if you were principal for the day? Room 6 students in New Zealand created their own schedules, while Linnea made a survey to ask readers what they would do if they were principal. 57. Book Reviews – This traditional pen and paper task can easily be shared with an authentic audience on a blog post. Check out a great example by year 8 student, Ella, who reviews Galax Arena by Gillian Rubinstein. 58. Wordless videos – Speech pathologist, Sarah, has compiled a list of wordless videos. You could embed one in a blog post and write a script, recount or reflection on the meaning behind the video. 59. Interactive Stories – Google Slides can be used to create interactive or ‘choose your own adventure’ type stories. See the examples on The Electronic Pencil blog. 60. Spelling/Vocabulary – Share your spelling words, or a set of interesting words you have recently come across. Define the words or create interesting sentences to share with readers, like Grace did in her blog post. You could even use a site like Spelling City and screenshot some of your activities. Summer came up with the idea of publishing an adjective of the month to share her love of words. 61. Grammar and Punctuation – Share your understanding of a concept you’re learning. Miss Jordan’s class made slideshows about apostrophes while Mrs Pratt’s students made comics about using there/they’re/their. 62. Newspaper – Media literacy and fake news are hot topics. Create your own online newspaper to share on your blog. Kathryn made Early Bird News in Google Docs and added the link to her blog post. It even includes fake news stories, advertisements and a comic. 63. Poetry – There are many types of poems. You might like to publish one that was written by someone else, or, even better, make up your own. Linnea created a fun poem about apples, while Miss Jordan’s class published their collection of haikus. Katie reflected on her feelings at a camp in The Lake Poem. 64. Satire/Funny – The ‘Onion‘ does this style better than anyone. Satire is a nuanced skill that many students enjoy trying out. Loic’s How the Orange Grinch Stole the Election is an example of satire. 65. Historical Report or Guest Author – Write a traditional report profiling a historical figure, or pretend you are a famous historical figure that is blogging about a significant event. Ellie posted her historical report on Alexander Hamilton. 66. Historical Stories – Create a story based on a certain time and location in history. Amelia created a historical story set in England and Australia in 1788. She recorded it as a podcast for her blog. 67. Historical Comments – The commenting section of a blog can also be used for students to ‘be the voice’. Check out Linda Yollis’ example where the students commented in the voice of a historical figure they were researching. 68. Maps – Find different types of maps (and from different time periods), that show the same location. What are the similarities and differences in the maps? Refer to Comparing Maps for ideas to help create your post. 69. World Views – If you could live in any other place and time, what would you choose and why? Check out these student posts on ‘If I could live anywhere‘. 70. Virtual Field Trips – It’s now possible to visit faraway places without even leaving the classroom. Virtual field trips can be created yourself or you can simply join in pre-arranged trips. Try Skype, Discovery Education or Google Expeditions to get started. Summer posted about her virtual reality experience to Macchu Picchu, while Maggie ‘visited’ the Amazon. 71. Global Issue – Select a global issue that you are passionate about and write a post to share your concerns. Anisha made a video about water conservation, Tuscany reflected on racism and Chloe took a stand against cyber bullying. 72. Natural or Human-Caused Emergencies – Write a post describing a natural disaster or emergency situation and the recommended response. Livea wrote about preparing for a natural disaster with an emergency kit. Also check out these Abode Voice natural disaster videos by 3/4W. 73. Did You Know? – Use information from a website like National Geographic Kids, Simple English Wikipedia or Fact Monster to publish your own ‘did you know?’ snippets around a particular topic. 74. News Reports – Read information on children’s news sites like Scholastic Kids or Time for Kids to summarize news stories for your readers with your own reflections or opinions included. See how Mariana responded to a news video by using color coding for summary, facts, understandings and questions. 75. Projects – Present your project as a blog post. Anton published his earthquake project as a long form blog post, while also converting the information into a downloadable PDF. 76. List of Items – Create a list of items that would be used in a certain time in history or particular location around the world. The students from Histories and Mysteries of the United States were required to list ten things a witchhunter would have in colonial Salem, Massachusetts. 77. Vocabulary – Choose a vocabulary word that you are learning about and write a post that describes this word in different ways such as: a definition, in a sentence, in an example/image, in a table/graph, in symbols/equations etc. Check out this vocabulary slide deck template by Meagan Kelly which students could fill out and embed in their blogs. 78. Real World Examples – Discuss times in your life you may use the concept you are learning. Check out Yestin’s Science Superfood Sudden Public Announcement post. Miss Jordan’s class looked for mathematical arrays in their classroom. 79. Favorite Topic – Write a post about your favorite math/science topic including links to information on the topic and some images with attribution. Seb’s favorite topic is the four fundamental fources of nature. 80. Experiment – Conduct an experiment and document the process, results and conclusion on your blog. Briana has a great example of a data report of a heel touch experiment, while Brooklyn’s experiment was about the length of classmates’ dabs. 81. Math Movies – Explaining math concepts through videos can be very effective. Check out some inspiring past examples from the students in Mr Avery’s class including Adding Decimals and The Avery Bunch: Fractions (six years on, this is still an incredibly creative example). 82. NRICH – This project by the University of Cambridge publishes weekly maths problem solving tasks for students. Students can submit answers on the website, but they can also publish them as blog posts. Problems are broken up into age groups. Here are the current live problems for: lower primary students, upper primary students, lower secondary and upper secondary. 83. Science Master – Curious about science? Science Master is a safe site where you can submit your own science question and get a personalized answer. Check out the responses Miss Jordan’s class received. You could blog about your questions and responses like they did. 84. Math Journals – Student blogs can be used as a journals to reflect on learning. Here are some math journal prompts from Read Write Think that students could base their reflections of their math lessons on. 85. Problem Solve – Explain how you solved a problem and include photos. Some students from Room 3 at Auroa School made videos to share solutions to their math problem solving tasks. Alternatively, you could publish a problem solving task in a post and invite readers to provide the solution in the comments. Kathleen has used this idea when parents were visiting the classroom. Tip: choose a problem where there are multiple solutions, or hold off on moderating comments until everyone has had the chance to respond. There are countless free online tools that can be used to create, publish, collaborate and present. If working with younger students, it’s important to check the terms and conditions on the site as some tools are only suitable for students over the age of 13. For more information and ideas on web tools that you can embed, check out this Teacher Challenge post. 86. Infographic – Use a tool like Canva, Piktochart, Venngage or Infogram to create an infographic and then write a post describing why you included the ideas you did. Alternatively, create infographics using several of these different tools then write a review of the tools you used. Courtney made a Piktochart about Peru, while Milani created one about Japan. Check out The Educators’ Guide to Infographics for more information. 87. Photography – Research using images, copyright and Creative Commons in posts. Add an image to your post with attribution and write a post about the image. Your image might inspire you to write a poem, like Summer’s Sonnet, or a story, like Sophie’s The Fawn and its Huntsman. Alternatively, you could write a post detailing what you learned about using images online. 88. Game – Gamestar Mechanic is just one site you can use to create your own video game. Check out this example from Aidan who meshed together a story and game design with a hero quest. 89. Image or Artwork – Create your own images using an online tool like Befunky, fd’s Flickr Tools, Wordle, CutMyPic, PhotoFunia, Picasso Head, Paper Critters, or Sketch.io. Check out Fluffy Whisker’s Create Your Own Image post. Sarah used a tool called Tagul / Word Art (similar to Wordle). She surveyed her class on their favorite foods and displayed the results in her word cloud. If you want to be blown away with what’s possible, check out the Fugle Blog where K-5 teacher, Tricia Fuglestad, combines art and technology in truly creative ways. She has produced a lot of tutorials for teachers and students to follow. 90. Video – Produce a video with Animoto, Biteable, Powtoon or another video creation tool, or upload your own video to YouTube, embed it, and write about the decisions you made when making the video. You’ll find ideas for creating videos here. Check out Thanumi’s comment starter video. 91. Screencast – Create a ‘how to’ screencast. Embed the screencast into your post or upload it to YouTube and then embed it. You’ll find ideas for creating screencasts here. Check out Devi’s How to Comment on My Blog to see an example of how you can use a screencast. 92. Poll – Use Google Forms or a plugin to publish a survey or poll. Follow up with a post that goes over the results, including graphs, charts, and analysis. Here’s Jarod’s food survey using Google Forms. 93. Lists – Use Listly to create a list of resources, links, people or ideas. You can even use this tool to crowdsource the list. Check out this Listly on Creative Prompts for Kids. 94. Talking Avatars – Create a speaking character using Voki to read your post or to interact with your blog’s visitors. Carlie’s Voki post provides an example of what an embedded Voki looks like. 95. Presentations – Publish the slides, Prezi, or video of your presentation in a post. Reflect on what went well and what could have been improved. This example on coding demonstrates what a Prezi looks like embedded in a post. Teacher, Larry Ferlazzo, filmed one of his student’s presentations and asked for feedback. This is an approach some students might like to take. 96. Comics – Create a comic using Make Beliefs Comix or Toondoo and share it on your blog. Robert and Louis made a comic called The Magic Trick, while Lauren create a comic about digital footprints. 97. Audio – Use Soundcloud or AudioBoom to share audio and embed it in a post. Check out the Soundcloud The Concept of Luck embedded in Maria’s post. YPCC Pod 2 class shares an Author of the Week series, while 5/6 students at Fyans Park Primary School create a regular podcast by embedding Speakr into their blog. 99. Padlet – This is an online bulletin board that you can embed in a blog post so visitors can share notes, voice recordings, videos, documents and links. Summer used a Padlet to ask her friends what is their favorite thing about school. Check out the Padlet embedded in this Free Web Tools post or the comprehensive guide on the Cool Cat Teacher blog. 100. Live Blog – Storify is a social network service that allows users to create stories and timelines using social media like Twitter, Facebook and Instagram. Media organizations use Storify for ongoing news stories such as natural disasters, elections and important events. Create your own Storify for a topic or event that collects tweets, Instagram, links, and more into one place or find a Storify created by someone else. Embed the Storify into a post and include an introductory summary and conclusion. Scroll down this news article and you’ll see how a Storify was used by the media to cover a natural disaster . Want A Free PDF Resource? This post has covered a LOT of ideas. To help you refer back to it regularly, we have adapted the information into an ebook in PDF format. You can save the PDF or print it for easy reference. You could even embed it on a page on your blog for students. Hopefully this list will ensure you or your students are never scrambling for blogging ideas again, however, it is far from exhaustive. Another idea is to recycle posts. You might take an old essay style post and turn it into a slideshow, podcast or video. Additionally you could make a part two of a post. You might have an old post with jokes, reviews or comics that struck a chord with readers. Why not do a follow up post in a similar style? Reflect on your best content and re-purpose or repeat it. If you have a class blog, you could create a page with writing ideas for your student bloggers. Room 6 in New Zealand have done this on their blog. This post is only the tip of the iceberg in terms of getting students to write online. Do you have any additional ideas to share with fellow bloggers? Have you tried any of these ideas? How did they go? Please leave your comments and links below. THANK YOU FOR THE EBOOK PDF VERSION! We hope it’s helpful, Sandra! Thank you for this. This is so helpful! I definitely have more ideas on themes for a blog that I can create for my parents and students. Fantastic. Good luck with your blogging! Thank you so much for sharing. Its Really useful thank you so much. Thank you for this wonderful blog! I am a student, however I teach Year 2 students, and I was running out of ideas on things to post on the blog (I have a separate blog for my classroom). I will definitely use your advice. We’re so glad you found this resource helpful and thanks for taking the time to let us know! Thanks so much for your post, it is inspiring and helpful. This is a wonderful resource that I will definitely share with my student teachers and interns! Thank you! That’s great to hear, Teresa! i would love to use these prompts and share one of them with you! just want to know if thats ok! have a nice day! You’re welcome to use the prompts and feel free to share anything with us too. This is a beautiful work! Congratulations Ronnie, Sue and Kathleen! I would love to translate this post and spread these ideas in my school. I have given it the pdf to one of our Teachers of English here at school. I have also many writing prompts for my Portuguese students made up either by them selves either by me that I could translate into English and share with you. Some of them have been inspired in “Emotional Ecology” for children, by the Catalan authors María Mercé Conangla and Jaume Soler, or in “Emotional Intelligence” by Maurice Elias article in Edutopia, with their permission. Thanks, Ines! You are welcome to translate and share, we’d just appreciate a link back to this post is included 🙂 We’d love to the prompts for your Portuguese students as well! This was incredibly timely! I run a middle school library, and a teacher had just asked me for ideas for blogging about a new novel her class is reading. We will be using the top 10 types of posts to have students use different formats of writing as they relate to the novel. So, a marketing campaign for the new housing development the family just moved into, or a sports article covering the soccer game, etc. She is thrilled with the idea, and we both look forward to trying more of the ideas in your post. Thanks so much! This comment really brought a smile to our faces here at Edublogs. We are so pleased that the resource is timely for you and your school! I love the idea of using the 10 sorts of blog posts as a novel response. Nice one! We’d love to see some of their work if you’re comfortable sharing a couple of URLs too (assuming they’re public blogs). I’ll be sure to share some. I was about to write it will be ages before we get to it, since we won’t start until November, but yikes–that’s only two weeks away! Thanks for such a great post and for including many examples of work done by students in the blogging challenge I run. Great to hear from you, Sue, and thank you for sharing the link. It will certainly be useful for students and teachers. The work you do with the student bloggers is incredible. Thank you for all of your work. I would encourage all teachers to check out The Student Blogging Challenge.